The High Bridge was originally a stone masonry aqueduct that was completed in 1848. 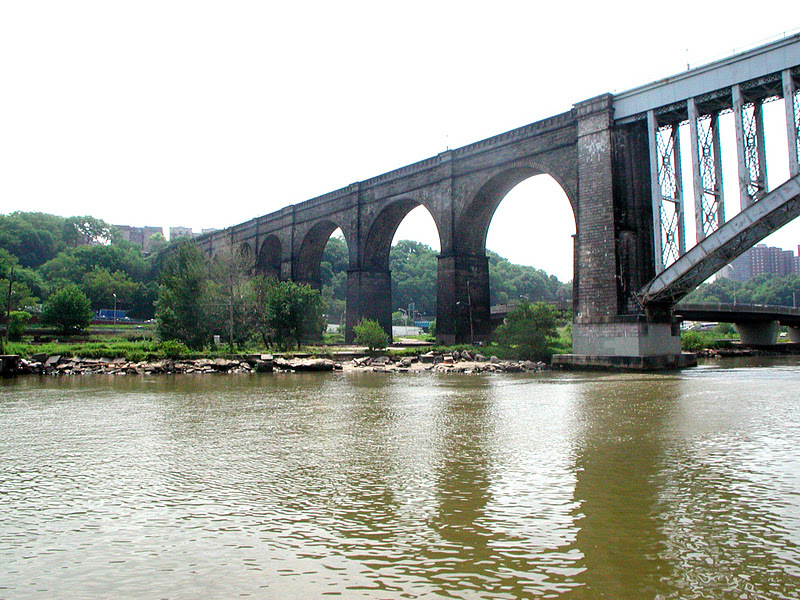 It consisted of fifteen arches that carried two cast iron pipes across the Harlem River Valley at 174th Street. It was designed by John B. Jervis and closely resembled the Puente Trajan in Spain that was built around 110 A.D. A third pipe and a walkway was added in 1864. By 1920, a channel had been built around Manhattan and the aqueduct was to be removed as an obstacle to navigation. After considerable protests it was decided to replace the five arch spans in the river with a steel arch. However, the resulting structure was not nearly as attractive. The New York City Water Department transferred the bridge to the park system in 1955. The bridge was closed to pedestrians in 1960 after several incidents of vandalism on the bridge. A 2006 study found no major structural problems on the bridge but said it would cost $30 million to reopen the walkway. So far, $5 million in funds has been raised. As usual, much more information is available from NYC Roads. New York City's Bridges: High Bridge by Mark Yashinsky is licensed under a Creative Commons Attribution-NonCommercial-ShareAlike 3.0 United States License.